The weather window has finally cracked, letting cool fall air settle down over Bermtopia. Mornings in the mid- to upper 30s -- and a burgeoning calendar of meetings with college faculty and administrators -- has resulted in the perfect storm that can only result in one thing. Shoes. My beloved Keen sandals are back in the closet. . . tennis shoes in the garage, on call for dogwalking in the park. And I've cracked open my supply of socks and "grown-up shoes." I don't mind wearing shoes. Done it all my life. But, after living in sandals all summer, there is something out-of-body about wearing "grown-up shoes" for the first time. And my first out-of-body shoe experience this fall occurred during a meeting at work a few days ago. I was bobbing my foot up and down (probably wondering whether the damn pow wow would ever end) and suddenly realized my foot was -- well, HEAVY. That there actually was something attached to my ankle. Surrounded by warm, rigid leather. 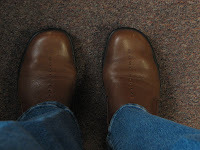 Fascinated by this unexpected sensation, I wiggled my toes, feeling the bunching of sock against the upper part my shoe. I rotated my ankles, tapped one foot on top of the other, reaquainting nerve and muscle with the concept of "grown-up shoes." I probably looked like a 3-year-old about to pee in church. But that's another topic. Why do I write about this? I'm not quite sure. Maybe it's yet another acknowledgment that the seasons are changing -- and so must I. Along with my shoes.